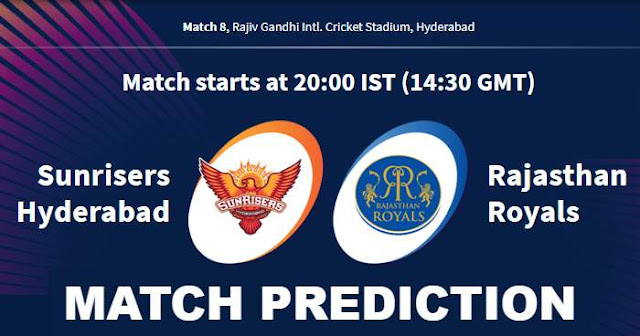 Home / Hyderabad / IPL / IPL 12 / IPL 2019 / Match Prediction / Rajasthan Royals / Rajiv Gandhi International Cricket Stadium / RR / SRH / Sunrisers Hyderabad / IPL 2019 Match 8 SRH vs RR Match Prediction, Probable Playing XI: Who Will Win? IPL 2019 Match 8 SRH vs RR Match Prediction, Probable Playing XI: Who Will Win? Probable Playing XI for SRH: Kane Williamson (c), David Warner, Wriddhiman Saha (wk), Manish Pandey, Vijay Shankar, Shakib Al Hasan, Yusuf Pathan, Rashid Khan, Bhuvneshwar Kumar, Sandeep Sharma, Siddarth Kaul. Probable Playing XI for RR: Ajinkya Rahane (c), Jos Buttler (wk), Sanju Samson, Steve Smith, Ben Stokes, Rahul Tripathi, K Gowtham, Shreyas Gopal, Jofra Archer, Jaydev Unadkat, Dhawal Kulkarni. Rajiv Gandhi International Cricket Stadium is not known as high scoring ground, looking both the pitch and the batting line-up of teams 185+ will be a par score on this ground. Our Prediction for IPL 2019 Match 8 SRH vs RR Who Will Win? Sunrisers Hyderabad are known to defend any total but the last match against Kolkata Knight Riders, Andre Russell single-handedly destroyed the whole Sunrisers bowling unit. On the other hand, Rajasthan Royals had a bad record at Hyderabad and had lost both matches played here against SRH. In our prediction, Sunrisers Hyderabad are more dominant looking on the stats are likely to win this match.